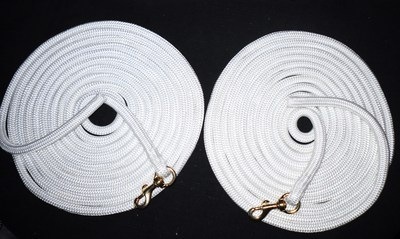 Made from 13mm diameter doublebraid yachting rope. This is a perfect rope for longlines, being strong and tough yet soft and flexible and is an ideal weight. The rope loops easily in the hands and has low abrasion qualities. The longlines feature solid brass trigger clips spliced into the rope with correctly constructed eye splices. The handlers` end is backspliced for double thickness at these points. Unlike webbing this rope stays soft and flexible even if left outdoors all year round. Use the pair as longlines or use a single one as a 22ft training line for Natural Horsemanship training.